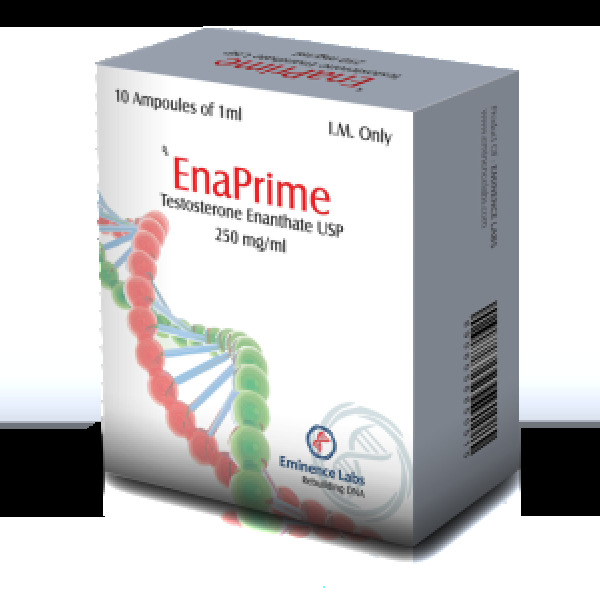 Enaprime is an ester of natural testosterone. He is responsible for the normal development of male sexual characteristics. In the absence of testosterone production, an almost complete alignment of functional, anabolic and mental functions is possible. Testosterone enanthate is a long-acting steroid. Depending on the metabolism and hormonal background, the average period of the drug is 2-3 weeks (the half-life is 6-7 days). In bodybuilding, triathlon and weightlifting, injections are performed once a week to maintain constantly high concentrations. The decisive advantage of testosterone enanthate is that this active chemical with a very strong androgenic effect also has an anabolic intensity, so it’s easy for everyone to add much strength and mass to it in the shortest possible time. Fast and strong weight gain is associated with a significant accumulation of water, because retention of electrolytes and water occurs. The accompanying effect is an incredible increase in strength, which keeps up with this accumulation of water in the body. Weightlifters and athletes of powerlifting, especially from high weight categories, highly appreciate this quality of the drug. For them, testosterone-enanthate and Sustanon (see also Sustanon) are steroids No. 1, which is also reflected in dosages. Strong accumulation of water has other advantages. Testosterone enanthate helps those who have joint problems, those who complain of pain and crunch in the shoulders, and those to whom their intervertebral discs show the first signs of wear. For bodybuilding athletes, the accumulation of water caused by testosterone-enanthate is a double-edged sword. Of course, you can quickly become massive and strong, but after a couple of weeks the reflection in the mirror is often completely smooth, flat, watery, edematous muscles. It looks as if it is inflated with air to these sizes and nothing happens at its voltage. Whoever does not believe, let him try to see the so-called “bodybuilding champions” in the offseason and in the build-up period, when they absorb incredible amounts of “dough”. Another problem with the use of testosterone enanthate is that it has a strong degree of aromatization, i.e. turning into estrogen. As a result, the body accumulates some fat, besides the phenomena of feminization (gynecomastia) are not something unusual.